Ireland is a breathtakingly beautiful island, known for lush green scenery, sheep, Irish whiskey, music, leprechauns, fairies, fresh cuisine and the friendliest of folk – Cead Mille Failte or a hundred thousand welcomes! The gorgeous West Coast Atlantic scenery is well appreciated on four feet or two wheels. The West coast is an approximately 3 hour drive from Dublin, or a two hour drive from Shannon airport, or right near Galway airport. An hour south of Galway lies the Burren, an approximately 180 square mile area of distinctive exposed limestone or karst mountain scenery and stone dolmen rocks. Two nights at Gregans Castle gives you time to explore this windswept and romantic area. 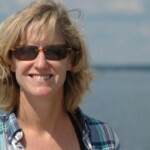 The hotel is a cozy, elegant manor house, with wood burning fires. Honeymooners love the four-poster bed in the Martyn suite. Golfers also love the proximity to Lahinch golf course. Head to Monk’s Pub in nearby Ballyvaughan for delicious fresh oysters on the pier. Stop in to see the Aillwee cave, one of the oldest in Ireland. Local town Lisdoorvarna is known for its hot springs and matchmaking festival each September. 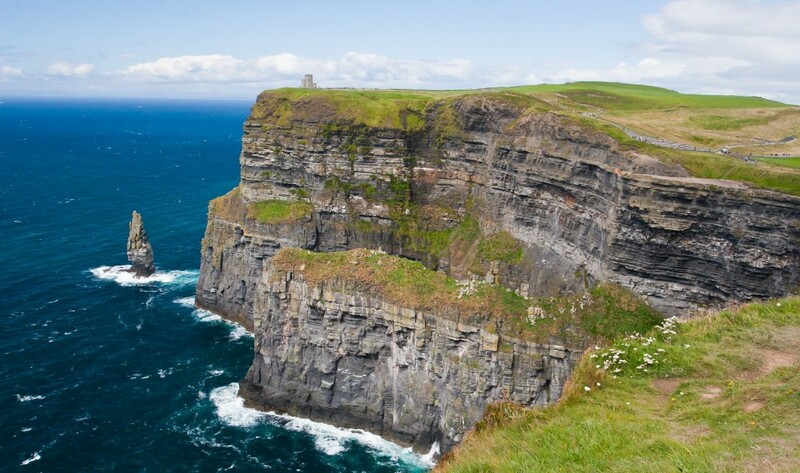 The highlight of the Burren is the Cliffs of Moher, Ireland’s most visited attraction, stretching for five miles and reaching a height of 703 feet above the ocean. On a clear day, you can see the Aran Islands: Inisheer, the smallest and closest island to Doolin; Inishmaan, the middle island; and Inishmore: the biggest. Take the 20 minute ferry from the nearby village of Doolin (famous for its live music) to Inishmore. Walk out to the prehistoric stone ring fort of Dun Aengus and explore the rugged, windswept island. That afternoon, take a separate 40-minute ferry back to Rossaveel where you can drive into the heart of majestic Connemara, the area within County Galway between the Atlantic Coast and the shores of Lough Corrib. The Coast Road (R340) leads right to Ballynahinch Castle (Set on 450 acres, this fairytale castle may seem imposing from the exterior, but inside there is plenty of warmth. The luxury suites in the Riverside wing are very comfortable, and overlook the river. If you prefer a more intimate manor house, check into the nearby 13- room Lough Inagh Lodge (This lodge is nestled on the shores of the lake, with each room facing the water. You’ll need at least two nights to best cover the region. 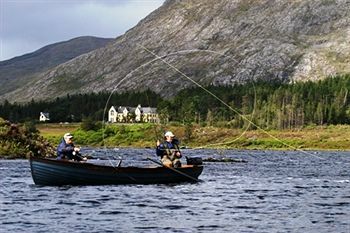 The area holds plenty of activities, including fishing, horseback riding on the beach with famous Connemara ponies, golf, and bicycling. The hiking is truly superb and local expert archeologist Michael Gibbons, owner of the Connemara Walking Centre in Clifden, is the best guide around. The next day, drive the stunning Coast Road, past beaches to the village of Roundstone where a stop at Malachy Kearns Bodhran Gaelic goat-skin drum-making music shop is a must, as is the clam chowder at O’Dowd’s pub. Walk up Mt Errisberg, a 2 hour walk up the hill from Roundstone. 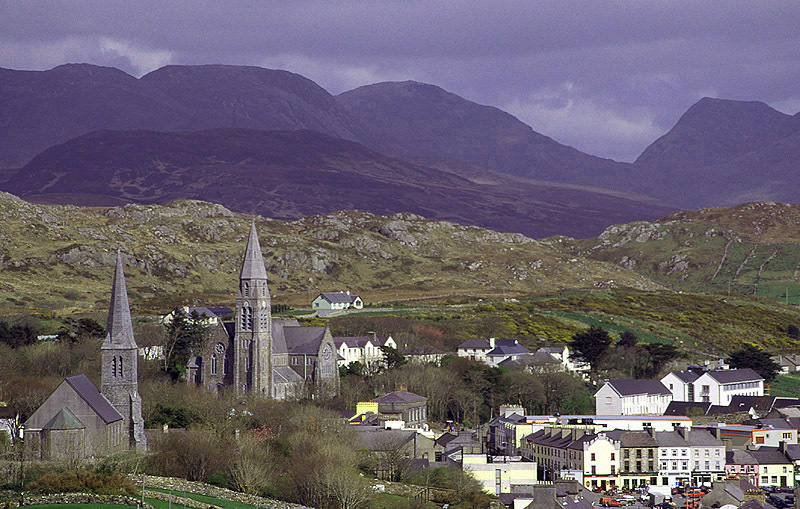 Continue on to the charming bustling town of Clifden, the capital of Connamara, is dominated by two beautiful churches built in the early 1800’s. Stop to shop at Millar’s on Main Street, well known for their woolen goods, arts, and crafts. Have a pint at the local watering hole Tom Kings Snug, located on Market Square. From Clifden, take a little more time to drive or walk the seven-mile circular Sky Road for views of Inishbofin and Inishturk Islands and white sand beaches. Head to the seaside village of Cleggan for crab claws at Olivers Bar. For more formal fare, visit the town of Letterfrack, the gateway to the Connemara National Park, where you’ll find the elegant Pangur Ban restaurant. Chef John Walsh’s Bailey’s Cream Cheesecake is a favorite. Further along that road lies the 1868 Kylemore Abbey, open for tours of the house and gardens. Head back to the castle or lodge along the interior bog road, with sweeping views of the Twelve Ben Mountains, and sheep dotting the landscape. 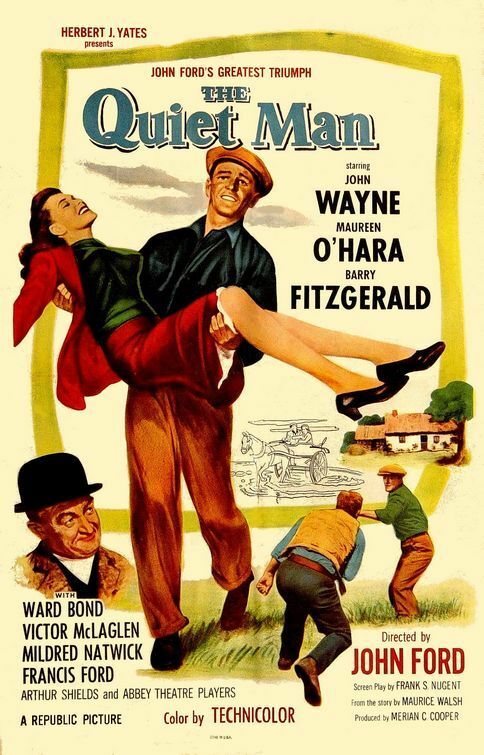 For a lavish West Ireland finale, head inland to the shores of Lough Corrib, to the village of Cong (where they filmed John Wayne’s “The Quiet Man”) home to the opulent and traditional Ashford Castle. 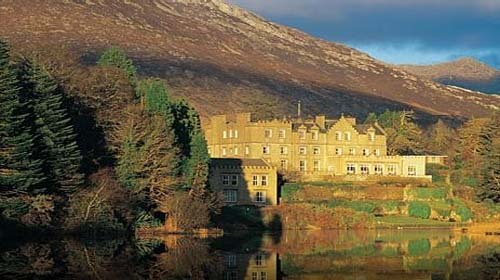 This former Guinness family estate, celebrates its extraordinary 70th anniversary as a hotel this year. The 350-acre property dates back to 1228 and features a 9-hole golf course, equestrian, falconry, boating, fishing and more. Honeymooners will want to stay in a spacious Master Suite overlooking the lake. The Connaught Room is the more romantic of the castle restaurants. After dinner, head down to the Dungeon Bar for an Irish coffee in front of the fire. For a more contemporary and intimate finale, stay in a lake view suite at the Lisloughrey Lodge, a former gamekeepers lodge on the Ashford grounds. Opened in 2007, the Georgian exterior was preserved but the interiors are decidedly modern and the cuisine at Salt delicious. From Ashford, it’s a 3.5-hour drive back to Dublin or a two-hour drive back to Shannon International.